Are we missing something? We are always adding to the website and welcome your feedback. How do I purchase DermExpert? Can I buy just DermExpert? DermExpert is an add-on product that works in conjunction with VisualDx Complete. A user must have access to a VisualDx Complete license in order to purchase DermExpert. How do I use DermExpert? 1. Select the camera or Dermatology icon to start. 2. If you selected the Dermatology icon, tap "Take Skin Photo". 4. Confirm or edit the DermExpert photo analysis. 5. Enter additional findings into the workup. 6. See the differential diagnosis results. 7. View clinical information and diagnosis images. How does DermExpert's technology work? Using our trained neural network model running on Apple's Core ML, DermExpert analyzes your image and identifies the likely skin lesion type. This lesion type is then entered as an input into our differential builder. Yes, VisualDx and DermExpert are HIPAA compliant. VisualDx does not collect any images or patient information. No images are transmitted from or saved to your device by DermExpert. I have an Android, can I use DermExpert? Please follow VisualDx on Facebook and Twitter for updates on when Android will be released. Does DermExpert use my patient's images for further machine learning? No. The images never get sent back to VisualDx and are not saved on your mobile device. We improve our proprietary machine learning algorithm using the VisualDx image collection. What devices does DermExpert support? Can my institution buy DermExpert? Yes, we can provide institutional licensing for DermExpert. Please contact sales for more information. I can't see how to buy DermExpert in the store, where is it? DermExpert is only available on iOS 11 devices and with a VisualDx Complete license. You will need to have a current VisualDx Complete license and upgraded to iOS 11 before you can purchase DermExpert. How many doctors use VisualDx? The exact number of health care professionals, including NPs, PAs, and MDs, using VisualDx increases all the time. We are currently in use at over 50% of U.S. academic medical centers and over 1,600 hospitals and institutions worldwide. What type of subscriber am I? If you can access VisualDx from your place of employment without entering a username or password, you are an Institutional Subscriber. Use the Institutional Subscriber FAQ. 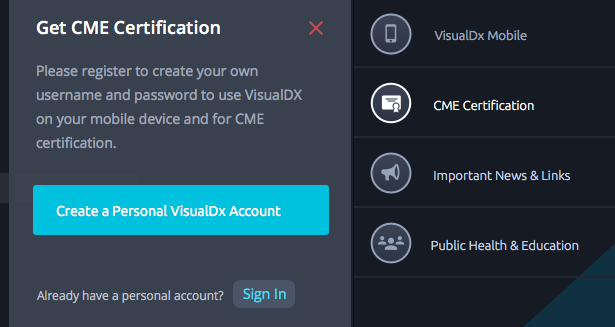 If you typically access VisualDx from your place of employment but have created a personal account for CME certification and mobile access, you have a Personal Account with an Institutional license. Use the Institutional Subscriber FAQ section unless directed otherwise. If you purchased VisualDx or received a product key from a third party, you are an Individual Subscriber. Use the Individual Subscriber FAQ. Why can't I see the new version of VisualDx? If you have a browser that is unsupported in the new VisualDx (VisualDx 7), we will redirect to the VisualDx 6 interface. You will have access to the new content in VisualDx. View our browser requirements for more information. Performance will vary with system hardware. Why am I seeing a banner at the bottom of my screen and I'm unable to get to all of the VisualDx content? VisualDx now has the option for limited content to be accessed by the public. If you have an individual subscription, click on “Subscriber Sign In” in the upper right corner and enter in your credentials to access the full content. If you are at an institution that has access to VisualDx and are still seeing the public option, ensure you are on your institution's network and try clicking on VisualDx again. If that does not resolve the issue, contact support@visualdx.com. How do I cite a VisualDx topic? Cite the VisualDx topic as a chapter in an electronic book titled VisualDx with editor Lowell A. Goldsmith. There are no page numbers and publication year should be the current year. Papier A, Craft N, Tharp MD, Shear N. Cocaine Levamisole Toxicity. In: Goldsmith LA, ed. VisualDx. Rochester, NY: VisualDx; 2016. URL: //visualdx/visualdx6/getDiagnosisText.do?moduleId=14&diagnosisId=54687&view=text. Accessed January 1, 2016. Where do the photos in VisualDx come from? The VisualDx image collection has been carefully curated from an international community of medical experts. Notable collections from many individuals and institutions have become part of the broader VisualDx image collection. The majority of images in the collection have been professionally scanned from 35mm color transparencies (slides). Contributors retain their image rights and are given access to a library of their scanned images. If you are interested in becoming a contributor or learning more about our image collection, contact our Image Collection Manager. Can I use images from VisualDx? We provide limited access for educational and non-commercial settings. Please refer to our Image Use Policy. For questions about our image use policy, please contact our Image Collection Manager. How do I get VisualDx Mobile for my iPhone, iPad, or Android device? Download the free VisualDx Mobile app on your mobile device from the iTunes Store or Google Play. If you access VisualDx through your institution, go here for username and password questions. What is my username? - Your username is the e-mail address that you used when you signed up for a VisualDx account. I forgot my password. – Enter your e-mail address here, and we will send you a new password. You may then log in and change your password if desired. Sign in to VisualDx using your username and current password. Click on your user name in the top right corner and choose “Change Password”. Your subscription may have expired. Log in to your account to manage an individual subscription or contact us for help. When can I claim CME credits? CME is included with all individual accounts. CME is accrued through the general use of the VisualDx product such as searching diagnoses or drug eruptions, or building a differential. You must have an active VisualDx subscription to claim and generate a CME certificate. VisualDx will store the CME credits associated with your account indefinitely. If you are a physician insured by Coverys, read the Program Overview or contact Coverys to learn how to take advantage of the VisualDx CME malpractice insurance discount program. How do I redeem a product or discount key? Start your VisualDx subscription by entering a product key or discount key. Note: Each product key can only be activated once. On occasion, a partner organization may inadvertently distribute the same product key to more than one individual. If you think that this has occurred, contact them to request another product key. Sign in to VisualDx with your username and password. Under the Account section, click "view payment history." Click "print" to print the invoice. Check your e-mail on the date of purchase. How do I cancel my VisualDx subscription? Go to My Account on the visualdx.com website and click “cancel subscription.” Follow the on-screen instructions to cancel your account. Your trial subscription will automatically end after 30 days. No further action is needed to cancel your subscription. Click “Create a Personal VisualDx Account” and fill out the form as instructed. 3. Search VisualDx in either the iTunes Store or Google Play. Download and enter the username and password you created in Step #2. Congratulations, you're ready to go! If you are an institutional subscriber, you may not need a username and password. Contact your IT department or contact us for help. As an institutional user, you do not have this option. Contact your IT department or contact us for help. NOTE: If you are an institutional subscriber trying to access VisualDx Mobile, you must first set up a mobile account. CME is included with all individual accounts. As part of an institutional license, you can create a personal account to accrue and claim CME credits. To get started, type a symptom, medication, country, or diagnosis in the search box. You can also click “select a problem area” to choose from particular pre-coordinated scenarios to build a differential without typing. How is selecting a problem area different than starting a differential through the search box? The “select a problem area” option is a way for users, particularly users of our previous version, to quickly build a differential from common problem areas. It is not comprehensive of the breadth of VisualDx but shortcuts for areas that have been requested by our users. 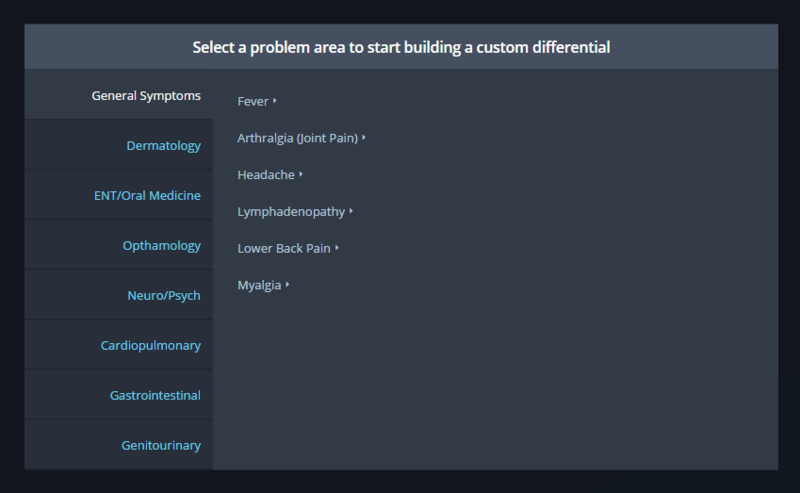 The search box allows you to access the full set of findings and diagnoses we have available while “select a problem area” represents a subset of commonly searched chief complaints. You can build the same differential through the search box that can be accessed through “select a problem area”. I'm looking for a certain question in the Workup section that I saw the last time I built a differential but now it's not there. Why? VisualDx medical staff work across specialties to develop the questions provided in every work-up. That means that depending on the required finding you enter, you may see different questions based on what is relevant for that finding. If you want to enter particular findings, you can use the Additional Findings typeahead. What does the DDx Strength indicate? DDx Strength accounts for relevance of findings entered with respect to the diagnoses returned. If you enter findings that were contradictory or unrelated to each other or enter generic findings that apply to many diagnoses, such as malaise, the differential strength will be poor. A high DDx Strength indicates that the findings you entered differentiate a handful of diagnoses from the ~3000 available and the set of findings entered seem highly correlated, such as your top match level is 5 out of 5 versus 3 out of 5 findings. What does making a finding required do and how does it affect my differential? For example, if Fever and Rash are required (green) and Headache is optional (gray), the diagnoses you see in a differential will be required to have Fever and Rash, but may not contain Headache. However, any diagnoses that also have Headache will be ranked higher in the results than diagnoses that do not. Optional findings do not remove diagnoses from your differential. At least one finding must be designated “required” to build a differential. Why does Filter appear sometimes but not others? The purpose of Filter in VisualDx is to filter out diagnoses that may not make sense for your patient. Therefore, Filter only appears when your differential results contain diagnoses that can be filtered out. This includes diagnoses that contain Chem/Bio/Rad/Nuclear Exposure, Travel, Medication Reaction, Bites & Stings, and Marine Exposure. 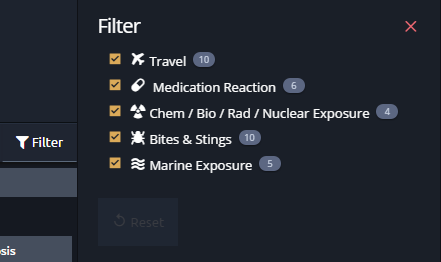 NOTE: If you enter a finding directly that falls into one of these categories, that category will not appear in the filter options. For example, if you enter in “Ghana” as a finding, Travel will not be selectable in the Filter options. To remove this finding, go back to the differential builder and edit the findings. Why are my results truncated? To improve performance of VisualDx, results are truncated to 150 diagnoses.